A mass of residents met with the MP this week, next to the Lode Lane plant, to vent their anger over employees using neighbouring streets to park their cars during their shifts. Despite attempts made by the car marque to tackle the ongoing problem, locals say workers are continuing to park their cars in their streets, obstructing the roads and blocking driveways. 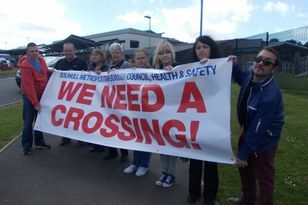 Residents say they are also faced with abuse if they attempt to confront any of the drivers over the issuse. David Seymoor lives near one of the bus stops, which transports staff to the factory. He said: “As well as the problems with parked vehicles, we also have to deal with around 30 to 40 people congregating at the bus stop several times a day. At 6am, they are talking loud, throwing rubbish and swearing. If you try to approach them, you just get abuse. “I feel very sorry for the residents,” she said this week. Residents also raised concerns that a recent consultation meeting held to discuss plans for a multi-storey car park on the Land Rover site did not have any members of the company’s management present. “JLR is always happy to play an active part in the community,” he added.